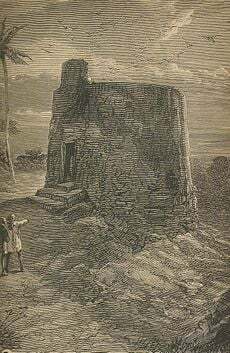 A late nineteenth century engraving of a Zoroastrian Tower of Silence in Mumbai. Towers of Silence (from Avestan "Daz," noun-"Dakhma," meaning "to burn from the Sun"), are circular raised structures traditionally used by followers of the Zoroastrian religion in their rituals surrounding death. Historically, when a member of the Zoroastrian faith died, his or her corpse was placed on an elevated mound structure (called in English "Temples of Silence") to be exposed to the natural elements and to carrion eating birds. This process was deemed to maintain the purity of the earth and the atmosphere during the process of bodily decomposition. The Zoroastrians place a great deal of importance on maintaining ritual purity during life and death. Towers of Silence were traditionally found outside urban areas where biological contamination and ritual pollution from the dead would be kept to a minimum. At one time, the most widely practiced religion in the world, Zoroastrianism has deeply influenced the religions of Judaism, Christianity, and Islam. It provided numerous concepts that were subsequently embraced by many other religious traditions including the importance of rewards and punishments, the soul's immortality, and a final judgment where the world is reordered. These concepts went on to have an immense influence on Christianity and Islam as well. The term dakhma or dokhma (from Middle Persian dakhmag) originally denoted any place for the dead. Similarly, in the medieval texts of the Zoroastrian tradition, the word astodan appears, but which today denotes an ossuary. In the Iranian provinces of Yazd and Kerman, the technical term is deme or dema. In India, the term doongerwadi came into use after a tower was constructed on a hill of that name. The word dagdah appears in the texts of both India and Iran, but it came to signify the lowest grade of temple fire in twentieth century India. The Zoroastrian religion considers a dead body—in addition to cut hair and nail-parings—to be nasu, unclean, that is, potential pollutants. Specifically, the corpse demon (Avestan: Nasu.daeva) was believed to rush into the body and contaminate everything it came into contact with, hence the Vendidad (an ecclesiastical code, "given against the demons") has rules for disposing of the dead as "safely" as possible. To preclude the pollution of earth or fire (Zam and Atar respectively), the bodies of the dead are placed atop a tower—a tower of silence—and exposed to the sun and to birds of prey. Thus, "putrefaction with all its concomitant evils" "is most effectually prevented." The towers, which are fairly uniform in their construction, have an almost flat roof, with the perimeter being slightly higher than the center. The roof is divided into three concentric rings: The bodies of men are arranged around the outer ring, women in the second circle, and children in the innermost ring. Once the bones have been bleached by the sun and wind, which can take as long as a year, they are collected in an ossuary pit at the center of the tower, where—assisted by lime—they gradually disintegrate and the remaining material—with run-off rainwater—runs through multiple coal and sand filters before being eventually washed out to sea. The ritual precinct may only be entered by a special class of pallbearers, called nasellars, a contraction of nasa.salar, caretaker (-salar) of potential pollutants (nasa-). The earliest reference to ritual exposure comes from Herodotus (Histories i.140), where the historiographer describes the rites to have been secret, and "vaguely" that these first occurred after the body had been dragged around by a dog or bird. Further, the Magi (a term that eventually came to signify a Zoroastrian priest but may not have meant that in Herodotus' time) practiced this quite openly, before they finally embalmed the corpse with wax and laid it in a trench. While the discovery of ossuaries (in both eastern and western Iran) dating to the fifth and fourth centuries B.C.E. indicates that bones were isolated in burial mounds, where the bodies were wrapped in wax have also been discovered. The tombs of the Achaemenid emperors at Naqsh-e Rustam and Pasargadae likewise suggest non-exposure, at least until the bones could be collected. According to legend (incorporated by Ferdowsi into his Shahnameh), Zoroaster is himself interred in a tomb at Balkh (in present-day Afghanistan). While general exposure of the dead is attested from earliest accounts, the ritual customs surrounding that practice appear to first date to the Sassanid era (third—seventh century C.E.). They are known in detail from the supplement to the Sayest ne Sayest, the two Rivayat collections, and the two Saddars. The use of towers is first attested in the sixteenth century. In the Iranian Zoroastrian tradition, the towers were built atop hills or low mountains in desert locations distant from population centers. In the early twentieth century, the Iranian Zoroastrians gradually discontinued their use and began to favor burial or cremation. The decision to change the system was accelerated by three considerations: The first problem arose with the establishment of the Dar ul-Funun medical school. Since Islam considers unnecessary dissection of corpses as a form of mutilation, thus forbidding it, there were no dead bodies to dissect so the Zoroastrian dakhmas were repeatedly broken into, much to the dismay and humiliation of the community. Secondly, while the towers had originally been built away from population centers, the growth of the towns led to the towers now being within city limits. Finally, many of the Zoroastrians themselves found the system outdated. Following extended negotiations between the anjuman societies of Yazd, Kerman, and Tehran, the latter gained a majority and substituted the dakhma with a cemetery some 10 km from Tehran at Ghassr-e Firouzeh (Firouzeh's Palace). The graves were lined with rocks, and plastered with cement to prevent direct contact with the earth. In Yazd and Kerman, in addition to cemeteries, orthodox Zoroastrians continued to maintain a dakhma until the 1970s when the dakhmas were shut down by law. Following the rapid expansion of the Indian cities, the squat buildings are today in or near population centers, but separated from the metropolitan bustle by forest gardens. In Parsi Zoroastrian tradition, exposure of the dead is additionally considered to be an individual's final act of charity, providing the birds with what would otherwise be destroyed. In the past several decades, the population of birds of prey on the Indian subcontinent has greatly declined, in equal parts due to increasing pollution, growth of the cities such that the natural habitat of the birds was destroyed, and diclofenac poisoning of the birds following the introduction of that drug for livestock in the 1990s (diclofenac for cattle was banned by the Indian government in 2006). The few surviving birds are often unable to fully consume the bodies. Parsi communities in India are currently evaluating captive breeding of vultures and the use of "solar concentrators" (which are essentially large mirrors) to accelerate decomposition. The right to use the Towers of Silence is a much debated issue among the Parsi community. The facilities are usually managed by the anjumans, the predominantly conservative (usually having five priests on a nine-member board) local Zoroastrian associations. In accordance with Indian statutes, these associations have the domestic authority over trust properties and have the right to grant or restrict entry and use, with the result that the anjumans frequently prohibit the use by the offspring of a "mixed marriage," that is where one parent is a Parsi and the other is not. ↑ Jivanji Jamshedji Modi, The Funeral Ceremonies of the Parsees (Anthropological Society of Bombay, 1928). Retrieved June 24, 2008. ↑ 2.0 2.1 Michael Stausberg, Die Religion Zarathushtras (Stuttgart: Kohlhammer, 2004). Retrieved June 24, 2008. ↑ Harry Falk, Soma I and II, Bulletin of the School of Oriental and African Studies (BSOAS) 52(1), 1989: 77-90. ↑ Malcolm Tait, India's vulture population is facing catastrophic collapse and with it the sacrosanct corporeal passing of the Parsi dead, The Ecologist. Retrieved June 24, 2008. ↑ Gerry Swan, et al., Removing the threat of diclofenac to critically endangered Asian vultures, PLoS Biology 4(3): e66. ↑ Sanjeev Srivastava, Parsis turn to solar power, BBC News South Asia. Retrieved June 24, 2008. Boyce, Mary. 1979. Zoroastrians: Their Religious Beliefs and Practices. London: Routledge. ISBN 0-415-23903-6. Darmesteter, James. Vendidad Fargard 5, Purity Laws. Retrieved June 26, 2008. Falk, Harry. 1989. "Soma I and II." Bulletin of the School of Oriental and African Studies (BSOAS), 52 (1): 77-90. Howarth, G. Encyclopedia of Death and Dying. Routledge, 2001. ISBN 978-0415188258. Kotwal, Firoze M., and Khojeste P. Mistree. A Zoroastrian Tapestry. New York: Mapin, 2002. ISBN 978-1890206222. Moulton, James Hope. 2005. Fire Temples and Towers of Silence. Kessinger Publishing. ISBN 978-1425314712. Scott, Paul. 1984. The Raj Quartet: The Jewel in the Crown; The Day of the Scorpion; The Towers of Silence; A Division of the Spoils. William Morrow. ISBN 978-0688030650. Stausberg, Michael. 2004. Die Religion Zarathushtras, vol. III. Stuttgart: Kohlhammer. Swan, Gerry, et al. 2006. "Removing the threat of diclofenac to critically endangered Asian vultures." PLoS Biology 4(3): 66. Wadia, Azmi. A Zoroastrian Tapestry. New York: Mapin, 2002. ISBN 978-1890206222. All links retrieved December 14, 2015. Jivanji Jamshedji Modi. The Funeral Ceremonies of the Parsees Anthropological Society of Bombay, 1928. Sanjeev Srivastava. Parsis turn to solar power BBC News South Asia, July 18, 2001. David Adam. Cattle drug blamed as India's vultures near extinction Guardian Unlimited, January 31, 2006. A Zoroastrian Tapestry The Hindu. History of "Towers of Silence"
This page was last modified on 14 December 2015, at 20:08.